As Warm As Toast: A catch up and my Michel Roux Jr experience - it has been a while! A catch up and my Michel Roux Jr experience - it has been a while! So anyway, basking in the afterglow (I’m calling it afterglow, it was probably just the fact I had gotten fatter whilst I was away and I looked fuller in the face), we decided it was time we started looking at new houses and have found a place and sold ours. With the stress of selling and the constant stream of viewings at 6pm most weeknights I’ve not had much of a chance to cook very much. Fortunately now that we only have to play the waiting game until the house is ready I’ll be very much up and running again in my kitchen; glass of wine in hand, music on and several recipe books strewn over the kitchen table. So this post isn’t a recipe but I did want to be sure to share a recent cooking experience I had with someone called Michel Roux Jr (maybe you’ve heard of him? You know, the 2 Michelin Star chef?). So I tootled off to London for a day cookery experience with 10 other people and the wonderful Michel. What a gent he was; so welcoming and knowledgeable – he made each of us feel like it was a pleasure for him to host us and teach us and I could not have wished for a better day cooking with my culinary hero. After having dressed the plates as “chef-ily” as we could, we went back downstairs to eat our creations with Michel and enjoy another couple of glasses of wine before heading back upstairs to cook our main course of pan roasted guinea fowl with roasted cauliflower purée, courgette ribbons and a black truffle sauce. 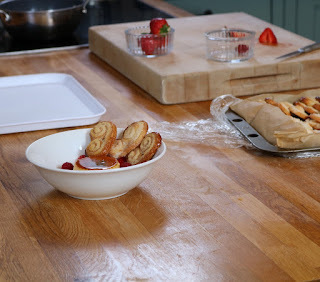 So after yet more wine and food the only thing left for us to do was turn out the crème caramel, and watch Michel make some Palmiers to go with the dessert. We had some group and individual photos and he signed books for us before we all left for the day. Hearts and tummies full to bursting. As days go, it was as close to perfect as it could have been. If you ever get chance to go to this cookery experience, grab the opportunity. It will honestly be one of the best days of your life. I promise you that.